With over twenty five years of experience in the field of manufacturing thermal controls, and with numerous satisfied customers in all industries, our leadership in this technology is unchallenged. Continuous product upgrading is achieved by strenuous and sustained R&D and many patents. All materials are of the highest grade. Before assembly all components are ultrasonically cleaned and inspected under microscope. Assemblies are spot welded with precision synchronous Spot Welders.All Spot Welders are the best quality Miyachi Spot Welders from Japan. There is no soldering at all. Stringent tests are carried out on 100% of the pieces at several stages of manufacturing. Our products are superior in all respects to imported cut-outs because we can afford to put in extra labour and painstaking effort inspecting and testing 100% of the pieces during production. Finally pre-dispatch testing of trip temperature is done twice on 100% of the cut-outs. Whichever PORTEX control is selected for your application, you will get dependable operation, the result of perfect engineering, controlled manufacturing and thorough testing. First Step – Testing for Trip temperature: Each thermostat is tested four times in our custom built testing ovens to determine the accurate trip temperature. We have four digitally controlled ovens which have been specially customized for our thermostat testing. Normal ovens have the heating element on only three sided. This results in uneven heating as the fourth side does not heat up as much as the other three sides. 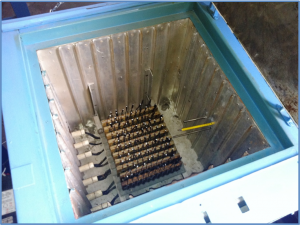 However, in our ovens, we have fitted the heating element in all four sides. This results in uniform heating from all the four sides. Moreover, each oven is fitted with a fan at the bottom. This ensures that there is air circulation in the oven so that there is uniform temperature rise in all parts of the oven. Each oven has a capacity to test one batch of 100 thermostats at one time. 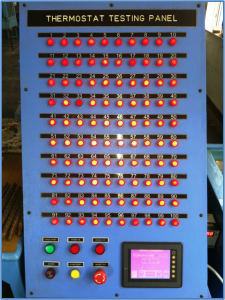 Each thermostat is connected to an LED in our PLC operated digital testing machines. After one batch of thermostats is fixed in an oven and connected to the LEDs, the temperature of the oven is raised at a rate of 1 degree C per minute. The oven temperature is raised from 40C to 170C. As and when each thermostat trips off, the machine stores the trip temperature reading of that particular thermostat. After all 100 thermostats have tripped, the machine gives a printout of the trip temperatures and then all the thermostats are sorted into their respective trip temperature ranges, for e.g. 40C – 50C, 51C – 60C, 61C – 70C, etc. 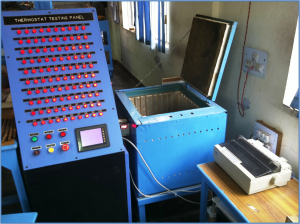 This testing cycle is performed twice for each batch. If there is any variation in the trip temperature of each thermostat between the first and the second reading, then that particular thermostat is removed and recalibrated. After the initial two testing cycles, the thermostats are sorted according to temperature ranges and each range is tested a third time. Then before dispatch, the fourth and final testing cycle is performed. 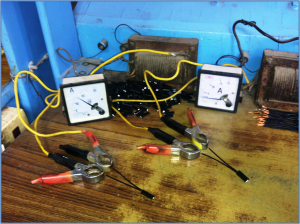 All the thermostats that are obtained from the third cycle are formed into batches and tested again according to the desired trip temperature of the customer. By the fourth testing cycle, we reach an accuracy of 99.5%. Any thermostat outside the desired range is removed and recalibrated afresh. This completes the four testing cycles and as a result, each thermostat is tested four times to accurately determine the trip temperature. Second Step – Testing for Chattering or Sparking: Each thermostat is tested twice to ensure that there is no sparking or chattering between the contacts. The first time it is tested when the thermostat is assembled. This is before the trip temperature testing cycles begin. The second time the thermostat is tested after the four trip temperature testing cycles are finished. After assembly, each thermostat is subjected to a load of 15 amperes. Due to the heat generated by the current flow through the bimetal, the thermostat will trip and restart with an audible snap action. This indicates that there is no sparking, chattering or creep action. If there is sparking or chattering, the current flow will be erratic and there will be nuisance tripping as the thermostat will not trip on or off with a snap action.